A Pop to make your Heartbeat! Home » A Pop to make your Heartbeat! 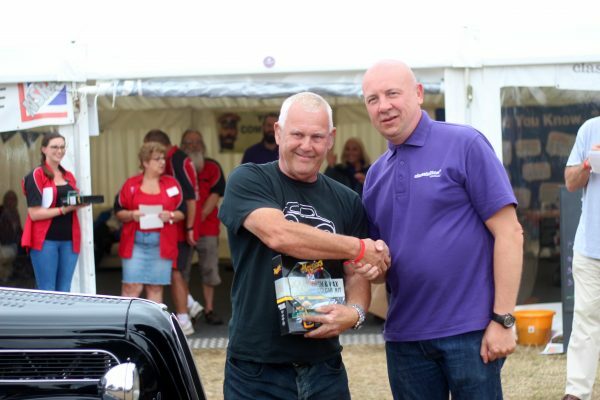 Back in August ClassicLine proudly sponsored the Pop Festival Award at the NSRA Hot Rod Supernationals. Great news, as this meant that our Darren and Christian could peruse the show field with intent and choose their pick of the show. For those that don’t know, the Ford Pop is a quintessentially British Hot Rod. Every Pop on the show field is different. The same core body style but each one has individuality; difference stances, running gear, paint schemes, even headlights! CL: you will find out more on Ford Pop’s later this month when we bring you our shown report on Popstalgia. But, when their eyes fell on a black 1957 Ford Pop, they were unanimous that this was the winner. 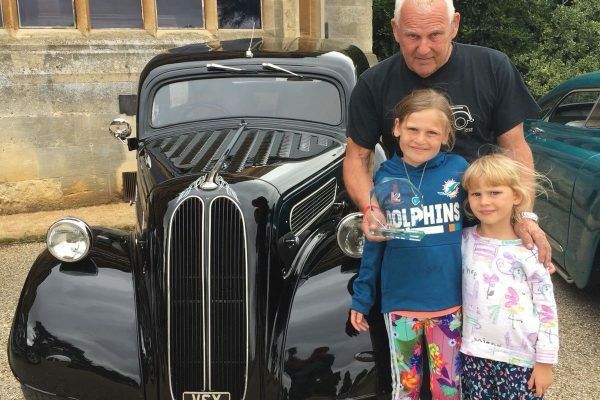 So, with it’s chrome undercarriage glinting under the sun, Darren presented the Pop Festival trophy to owners Alan and Susan Lowes. After the show, we ‘popped in’ to catch up with Alan and Susan… well, okay, we emailed them… to get the story behind their show winning Pop. Alan, how long have you have the Pop? The first time I saw the Pop was in a classified ad in Custom Car Magazine in August 1999. After a viewing, the deal was completed, and I became the 12th owner of the Pop since 1982. Once the car was home, my wife, Sue, nicknamed the Pop ‘Herbie’. I did try telling her that Herbie was a VW Beetle in a film, but it stuck, and is what the car is referred to by family and friends! 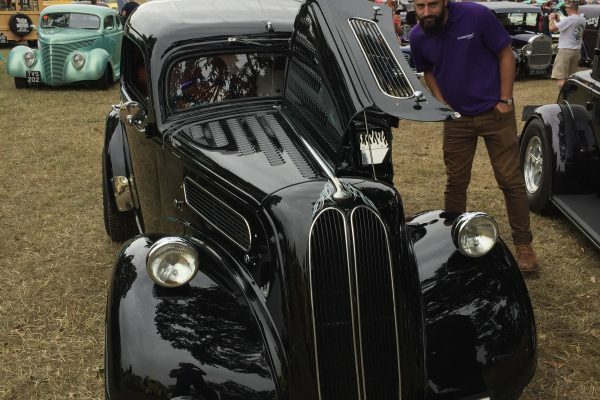 So, if you are the 12th owner, we wonder if the car has an interesting history? 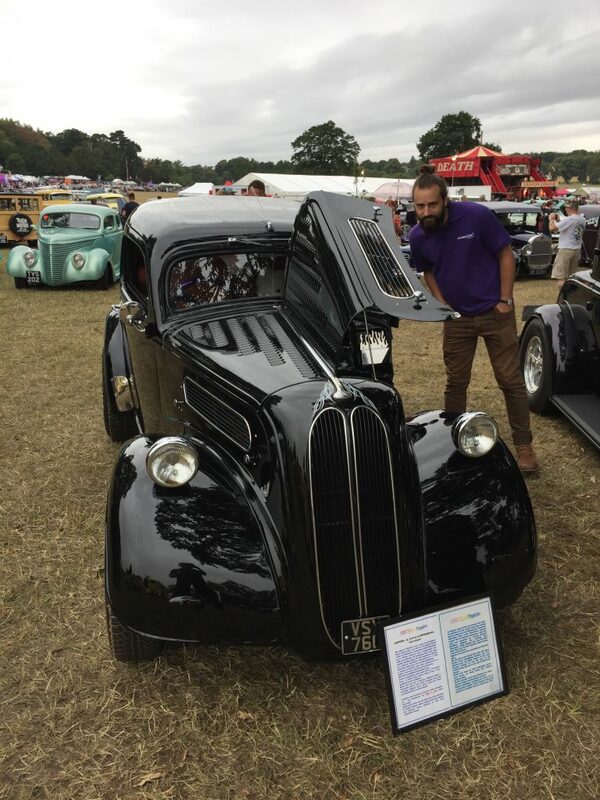 When we got there, the Audition was like a car show with fellow hot rodders from the North East. Four cars were picked including my Herbie – not only that, but we all had walk in parts and we were required to drive our own vehicles! So, in October 2000, we all spent three days rehearsing and filming at Goathland. The episode was aired in February the following year, in an episode called ‘Not So Special’ starring Geoffrey Hughes and Jean Alexandra featuring a Hot Rod road race. CL: Wow, what an experience! So, tell us what the car was like when you first got it? 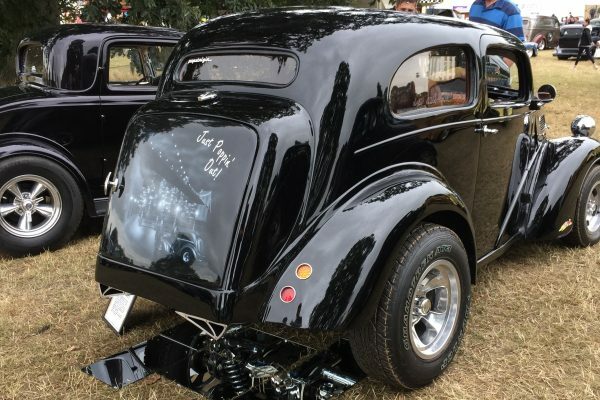 The Pop was in good condition actually – it had under gone a re-build in 1982 including a roof chop. I was informed by one of the previous owners that the Pop was customised in Sutton Coldfield and had been through several resprays. But over the years, I have made various improvements to make it more reliable. Every winter, I do something to the car! 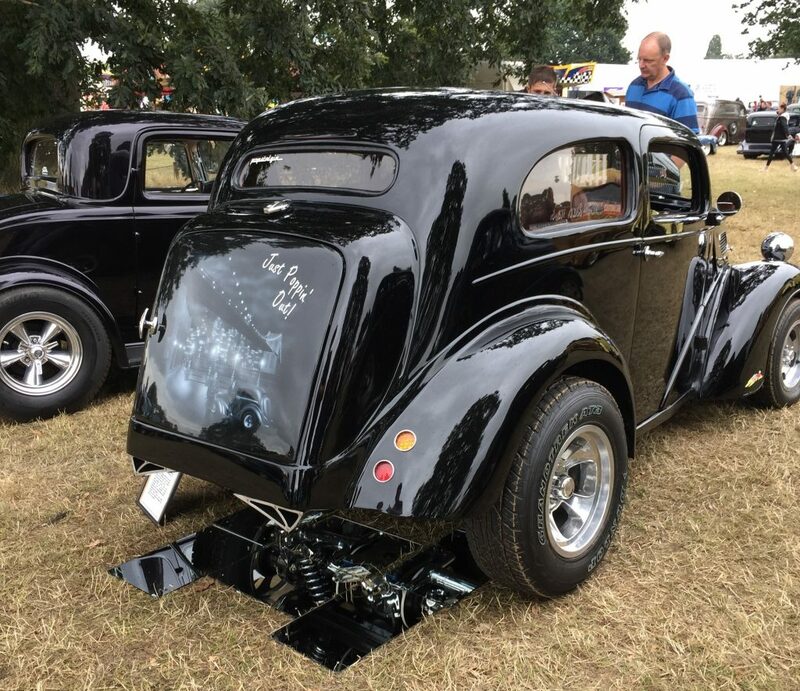 Herbie has a 4-inch roof chop with a donor roof from a commercial Vauxhall, which has four ribs to prevent the roof from drumming. At the front, we have a 3.9 litre V8. I changed the SU Carburettors to a four-barrel Holley 390 fitted to an Edelbrock inlet manifold. The inlet and manifold are married to the block and exhaust fumes feed into a 2 ¼ inch polished stainless-steel exhaust. The rocker covers and air filter housing are polished, and I have a chromed 100amp alternator and chromed oil sump. This is all encased on a vented bonnet with 170 louvers to aid cooling! The front axle is from a Vauxhall viva with upgraded 10-inch ventilated discs fitted with polished 4 pot callipers. At the rear, there are four-inch oversized rear wings. 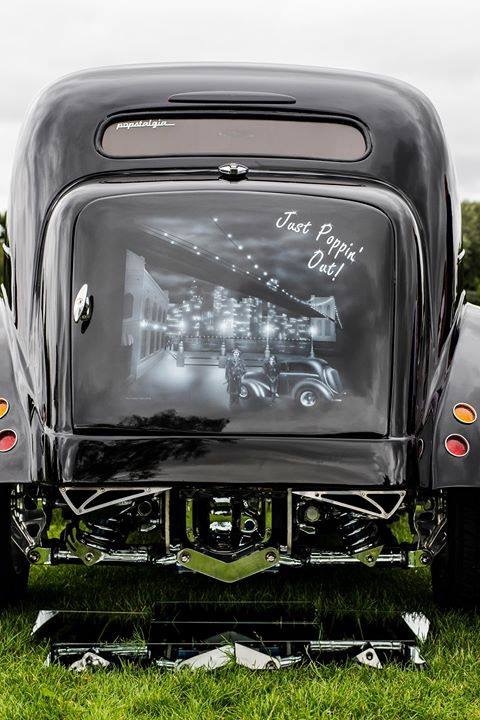 The boot lid opens from left to right as opposed to top to bottom like the original – you will have also noticed the airbrush artwork on the boot. Underneath, the Jaguar XJS rear axle was shortened, four-inches removed from each drive shaft and each drive shaft is octagonal in cross section. Both hubs have detailed lattice work and all polished by hand! I designed, fabricated and mirror polished the stainless-steel exhaust tips and panel to the boot floor. I also have chromed diff cover, so lots of polishing! Inside, the entire cabin has been retrimmed by Simon of ‘Hide n Seat’. The headlining was replaced with ply covered in ivory Alcantara. The wooden lower dashboard was custom built trimmed in biscuit colour leather with door cards having a leather quilted diamond effect. The front seats are bucket seats from an Alfa Romeo. The colour is BMW gloss black. 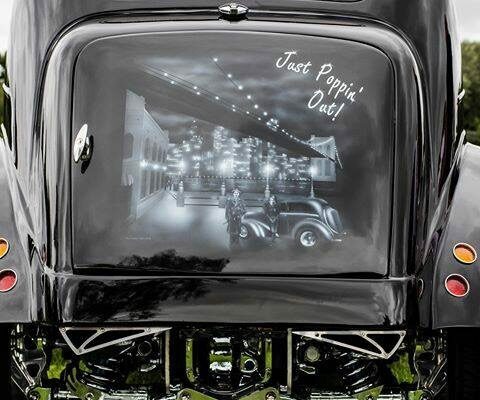 I designed mural on the bootlid, using a gangster Bonny & Clyde theme as inspiration. I am also fascinated by the bridges so designed the portrait using the Brooklyn Suspension Bridge with the Manhattan skyline in the background, which was all brought to life by airbrush artist Del Stainton. The tag line is ‘Just Poppin Out’…I often say this to my wife! Sounds like you have done a lot of work to the car Alan. Were there any headaches along the way? As with all old cars there are always challenges! But I have been gradually improving reliability over the years. This year’s winter project is to sort the cooling issue and change to an aluminium radiator with two fans. This reminds me, whilst on a cruise, we rounded a bend and I noticed two gentlemen sitting on a garden bench outside a house with a few discarded beer cans on the floor. 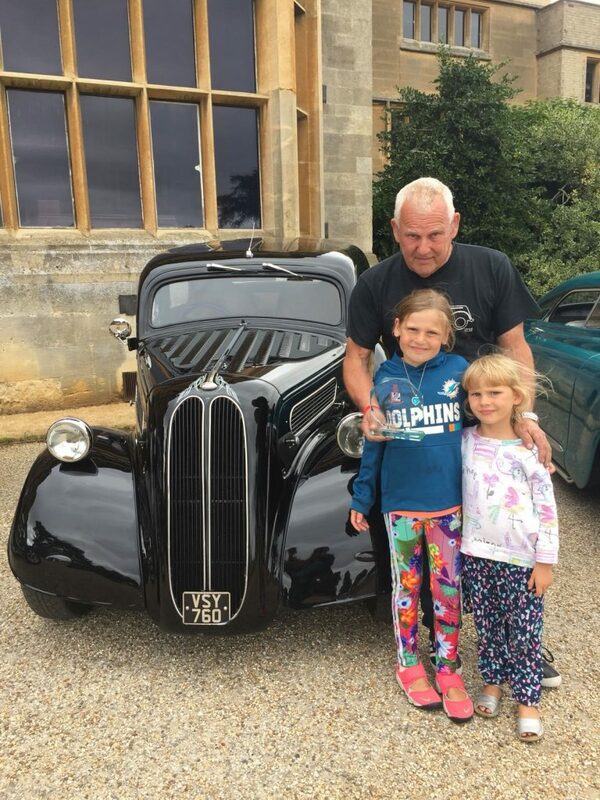 I said to Sue, ‘look who is sat on the bench’, it was the actor Craig Charles and his younger brother…at that point the engine over heated, and Herbie stalled. Craig crossed the road and offered to push start the car, I thanked him, said it was an auto so Sue, Craig and myself pushed the Pop onto his driveway. Whilst cooling, I showed him my Heartbeat photographs – he replied, ‘how come you have photos of my best mate’ (Geoffrey Hughes)! He posed for some photos…this was an experience for us both. Yes, for sure. Herbie has won numerous awards over the years. The first car show I attended was in 1999 in Saltburn by the Sea and I was given a prize. 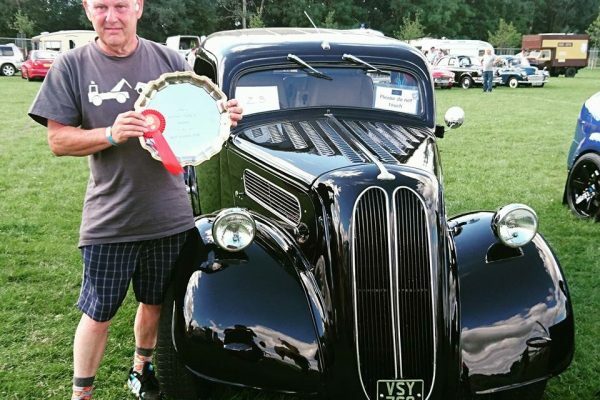 My proudest day was being awarded best Pop Festival trophy at the NSRA Hot Rod Supernationals by Darren from ClassicLine. What made my day so special was having my family there to share the moments, this day was totally beyond all my expectations. Where can we see you next Alan? Next show will be Popstalgia later in September, then Whitby Kustom at the end of October. CL: We will see you at Popstalgia! 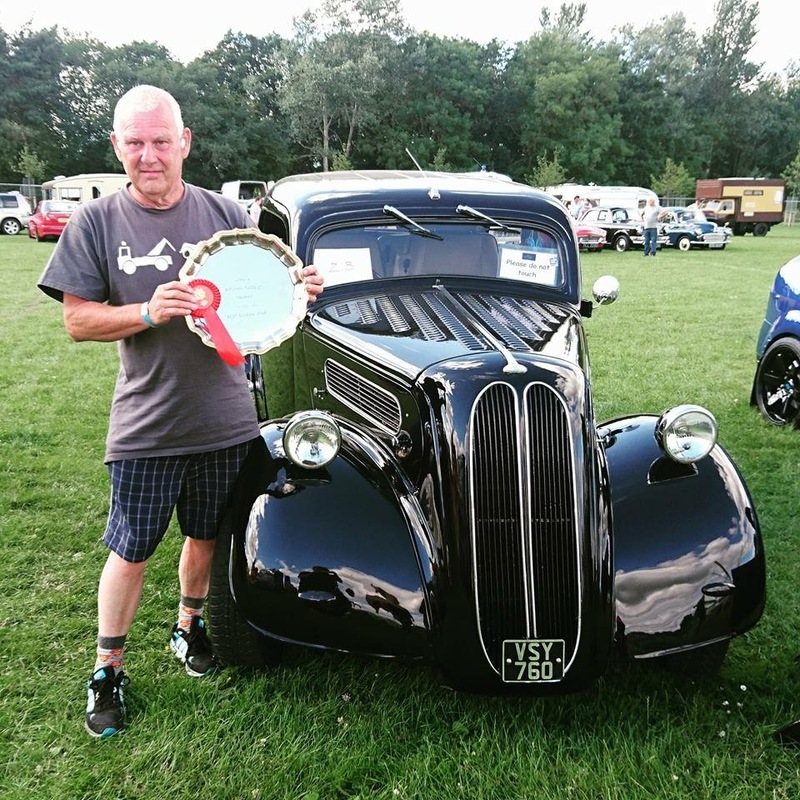 Ford 100e – E’s at the Ace!